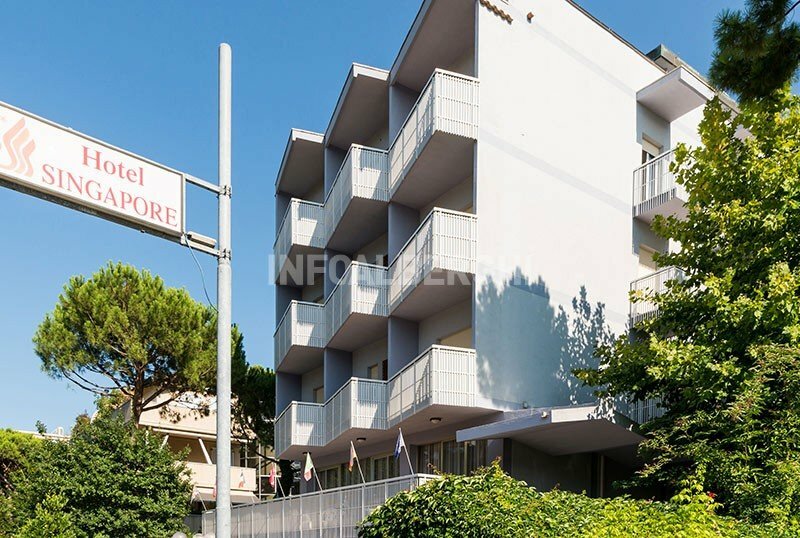 The Hotel Singapore is a 3 star hotel in Milano Marittima family managed in a quiet area not far from the pine grove and the beach, it accepts pets of small and medium size. The hotel is located in Milano Marittima, in a quiet and green residential area. In 5 minutes walk you can reach the pine grove and the equipped beach. They all have a private balcony, telephone, LCD TV, WI-FI, ceiling fan, bathroom with shower and hairdryer, safe. On request: air conditioning and minibar. FAMILIES: triple, quadruple and interconnecting rooms available with one double, one room, two beds and a shared bathroom. Garden, open-air porch, sun terrace, free use of bicycles with child seats and tandem, bar, TV room, elevator, aperitif offered every Sunday. For a fee: fax and photocopy service, laundry service. PARKING: uncovered and free for all customers. AIR CONDITIONING: free in the common areas, on request and payment in the rooms. CONVENTIONS: beach, Milano Marittima tennis club, FBI gym in Milano Marittima. LUNCH AND DINNER: three-choice menu of meat and fish, with traditional recipes of Romagna accompanied by warm side dishes, vegetable buffet, fruit and desserts. OTHER: every week a typical local dinner is organized, an evening based on assorted granitas, an evening with spoon desserts and an aperitif every Sunday. In hotel: indoor and outdoor playground area, strollers, entertainment with meals. Paid: baby sitter and pediatrician. At meals: baby menu, baby food, high chairs. The prices of the price list are per person per day for a minimum stay of 3 days. Reductions not applicable in connecting rooms for which the estimate is personalized. It does not apply from 01/07 to 26/07 and from 03/08 to 27/08.